Vientiane: President Barack Obama cancelled what would have been his first meeting with Filipino President Rodrigo Duterte, after Duterte described Obama in vulgar terms, a White House spokesman said on Tuesday. 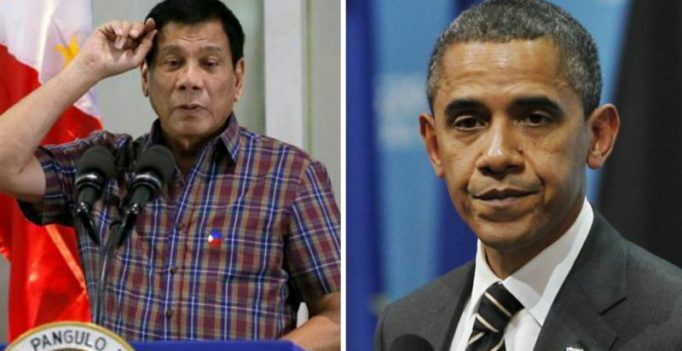 Duterte, a plain-spoken populist known for his colorful remarks and his campaign against illegal drugs in which thousands of people have died, described Obama as a “son of a b****” to reporters on Monday, a day ahead of the planned meeting in Laos, where South Asian leaders are meeting for annual summits. Obama learned about the insult as he emerged from the Group of 20 summit in Hangzhou, China. At a news conference, he said he had told his aides to speak with Philippine officials “to find out is this, in fact, a time where we can have some constructive, productive conversations,” leaving little doubt that the meeting would not proceed as planned. “I always want to make sure that if I’m having a meeting, that it’s actually productive and we’re getting something done,” Obama told reporters. Instead, Obama now plans to meet later on Tuesday with South Korean President Park Geun-hye, said Ned Price, spokesman for the White House National Security Council – a meeting where the response to North Korea’s latest missile tests is expected to be on the agenda. Obama arrived in Vientiane just before midnight on Monday, for the first visit by a sitting US president to Laos, where he wants to begin to address the legacy of US bombing during the Vietnam War. “Plenty will be killed until the last pusher is out of the streets. Until the (last) drug manufacturer is killed we will continue,” he said. The Philippines has been a key US ally in its dispute with China over the South China Sea, in which Washington blames Beijing for militarising a vital global trade route and jeopardising freedom of movement at sea and in the air. An arbitration court in The Hague in July invalidated China’s vast territorial claims to the waterway after a case was brought by the Philippines, a ruling that Beijing refuses to recognise. Duterte said last month he expected all ASEAN members to support the arbitration court’s ruling, but that the Philippines would not raise the issue in Laos.